You might remember a while back Tony took a trip down to the Dominican Republic courtesy of our awesome friends over at General Cigar. He got a very neat tour and had an awesome time. You can read more about it from his recap here. 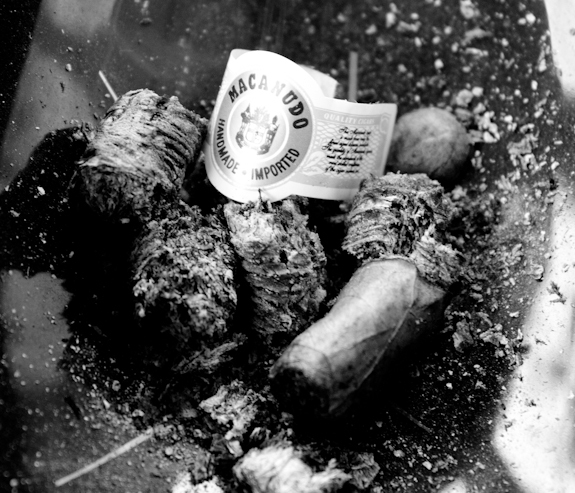 He did an awesome job of detailing the whole trip including all the educational pieces that General Cigar mixed in. If you haven’t read it yet, make sure you do now. 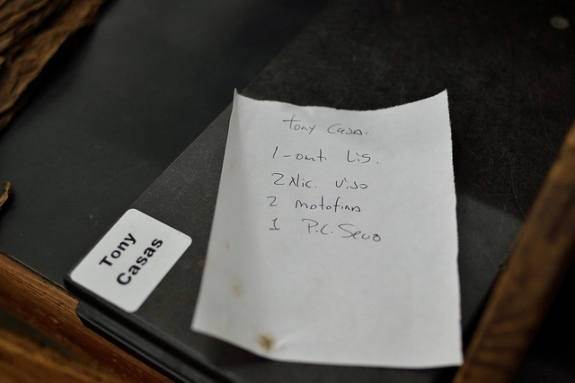 While on the trip, Tony had the chance to blend and even help roll a special cigar of this own. 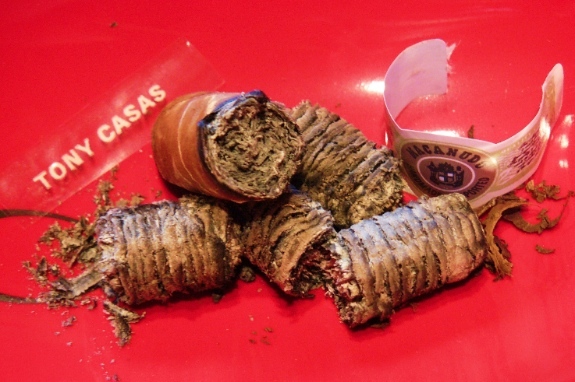 He got to choose all the tobacco leaves that went into it and sprinkled a little bit of sunshine into the recipe! lol. When he came back, he graciously sent me one of his samples and today I am going to review it. As a special treat, I also found out that Tony sent one of these sticks over to our friend Jeff, so I sneakily went behind his back and asked Jeff to review it as well. Check his thoughts out at the bottom of the post and a big Thanks to Jeff for sending it along to me! 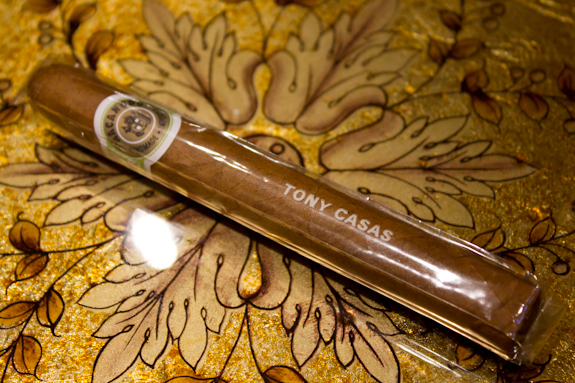 So enough with the chatter, let’s see if Tony is next master cigar blender! So what to say here? I’m not too sure. I’ll be easy on Tony since it was his first attempt. I have to point out the mess of fillers he put in this stick, it’s like he grabbed one leaf from every pile and put them together! Just joking, I’m sure it made sense in his head. 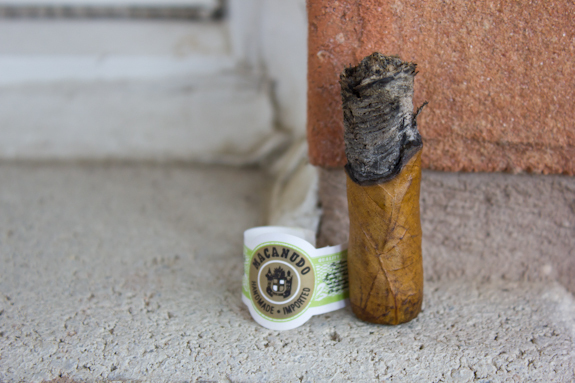 Good job Tony, you’re well on your way to becoming the best Texas grown cigar maker out there! This isn’t a new pairing here but it is the last bottle I have (and probably last I will be able to get for a long time). 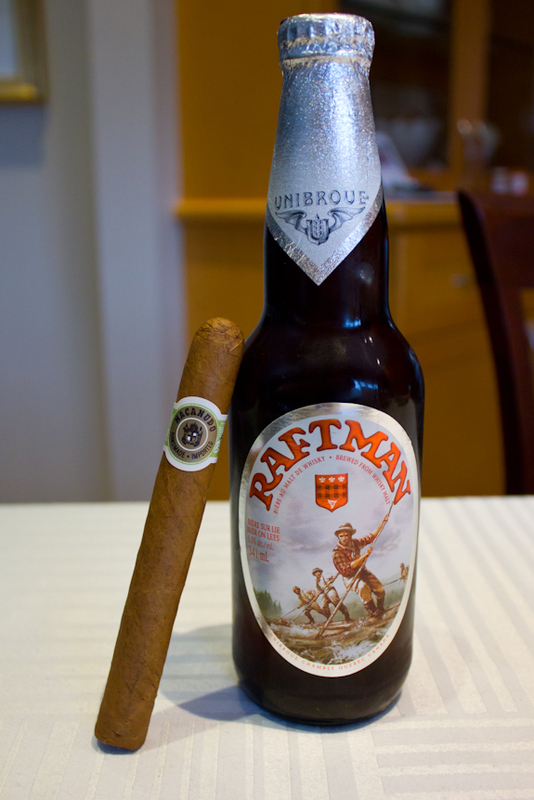 This offering by Unibroue is called the Raftman and is brewed with whisky malts. I’ve only ever been able to find it when I was in Quebec which is a good 5-6 hour drive away. The flavors are fantastic with a great mix of oak, a hint of those whisky malts and a nice helping of regular malt. There’s even a touch of citrus in there too, very good stuff! It paired well with the Macanudo Tony Casas because it’s not an overpowering beer so it was a good choice. The wrapper is fairly veiny and bumpy. The pack is firm with no discernible soft spots. Wrapper smells of tobacco and light cedar with very faint barnyard. Foot smells of tobacco, not much more. The cold draw is snug and doesn’t offer up much other than tobacco flavor. 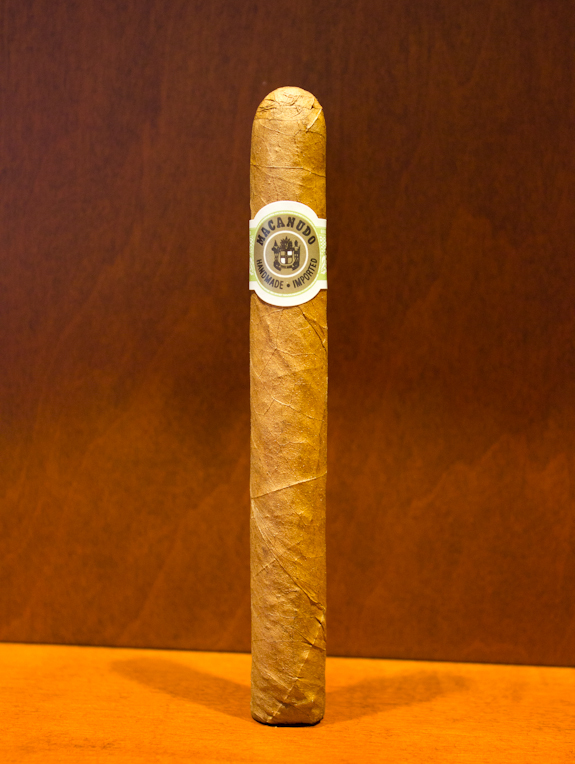 First draws are of lightly sweet tobacco and cedar on the tongue with a slight pepper bite. It’s mild and smooth with some nice cedar on the retrohale. The stationary smoke is very light but has a nice aroma. feeling it in the back of the throat, but the body is still mild, although it is climbing a bit. The retrohale continues to be cedary and lightly sweet with a peppery sting. Two inches in at 35 minutes, I’m now getting a bit of acidic brightness and pepper has faded but is still there. The small amount of sweetness that was there has also departed, but I’m enjoying the aroma through the nose as I take a draw. Halfway through, I’m starting to pick up some creaminess, but not a lot. The body is at medium and I’m still getting a bit of peppery tickle at the back of the throat, though it seems to come and go. Burn-wise, I haven’t even had to think about it, a bit wavy at times, but mostly even. Into the final third at 1 hour, the spice has faded once again and nuttiness has come into play. Further down, the pepper zing has surfaced again on the tongue and lips. With 1-1/2” left, the flavors have washed out, but the burn remains cool to the last inch, where I stopped at 1:20. Pretty slow burn on this one. were great. Now I’m really looking forward to trying the Drew Estate and Joya de Nicaragua blends he did. I paired it with Lagunitas New DogTown Pale Ale, but I think it would go better with a cup of coffee. 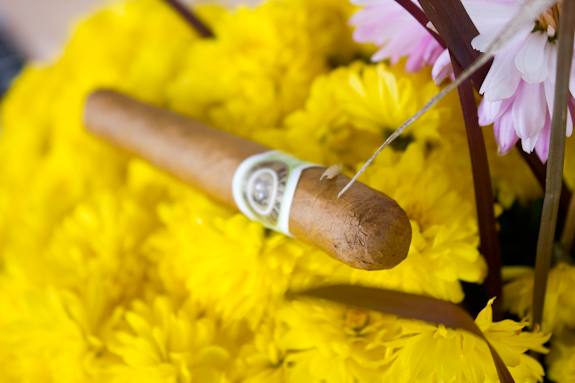 That’s a beauty of a cigar right there! Shows you guys no NOTHING about cigars. HAHA! Just kidding. In fact, I am surprised you guys even smoked the whole thing. 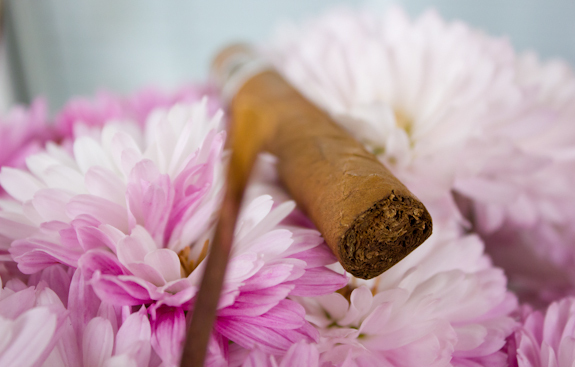 If I can say that I took anything from the experience it would be that I know nothing about cigars. This whole deal was so tough, and even then. I wasn’t happy with what I made. 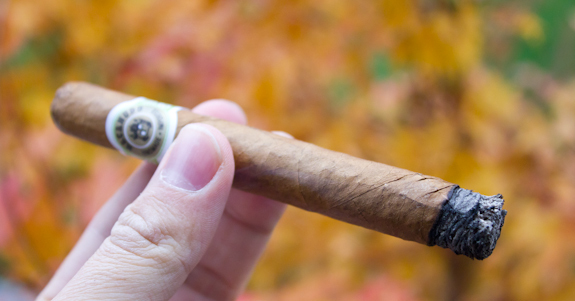 It was a great experience, and nice to have cigars to call your own, but the turnout wasn’t nearly as good as I would have imagined. Glad you guys had fun with it and I’m very glad I was able to share them with you both. Thanks for going easy on me! Hey man, I really enjoyed the experience. Thanks for sending me one to try! I had forgotten about the little review I sent to Daniel, since it was about five months ago. When are these bad boys be hitting the market? When will these bad boys be hitting the market? PS. 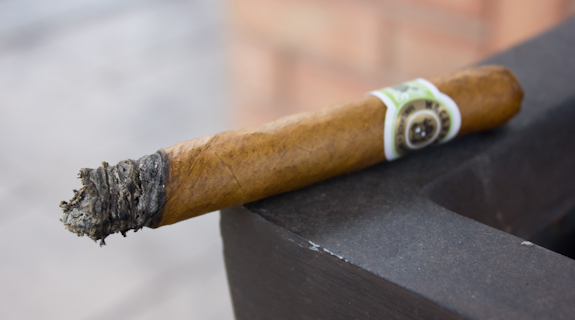 I think the “tapered” foot you speak of is caused by there “How the hell do I smash this cigar into the box” effect. Henceforth, known as the “El Paso Press”.